He passed the first day with flying colors. Catcher checking Bodie’s crate for toys and treats. I’m not training Bodie to HAVE separation anxiety but to teach him to relax away from my constant presence. This is one of the hardest behaviors to work through, but as necessary as house training. Yet I wonder how many people actually think about how to train a confident house dog. Usually I wait two weeks for a new puppy to adjust to his or her new home before I leave them alone. Bodie has been here for only six days and, well, life happens and I needed to get some food and Catcher needed a vet visit. Bodie had been in/out/in/out to potty early this morning. He’d had a chance to run (on lead) in the back yard, eat twigs, grass, pull on the leash, jump on me, all behaviors I’ll deal with over time. For now he is allowed to be a happy, hyper spoiled brat, to some extent. But today is the big test of his temperament. Would he scream and yell and whine while he was alone in his big crate, that is filled with toys and comfortable towels, in a cool room? I put him in the crate with a small treat and turned on some classical music to soothe his troubled soul, a trick I’ve used for years with other puppies. There have been several stages that led up to today. Bodie has remained in his x-pen in the kitchen hallway while I’ve gone outside to get the mail, while I showered or while I’ve cleaned the yard. It’s not like he has been totally alone either, as he has the other dogs and the cat for company. But today was a big step up for him into the big world. This procedure has been successful for me. One day the pup is alone for an hour. A week later he’ll be alone for two hours or twenty minutes. He never knows when I’ll return, simply that I will always return and will reward him with hugs, treats and a long run in the back yard. Today was as hard on me as it was on him, probably easier. But when I dropped Catcher off from the vet the house was quiet. When I returned from the grocery store and went into the bedroom to check on Bodie he was still asleep. I’m so proud of him. There’s always the big list of what-if horror stories that go through my mind each time I leave a new puppy. 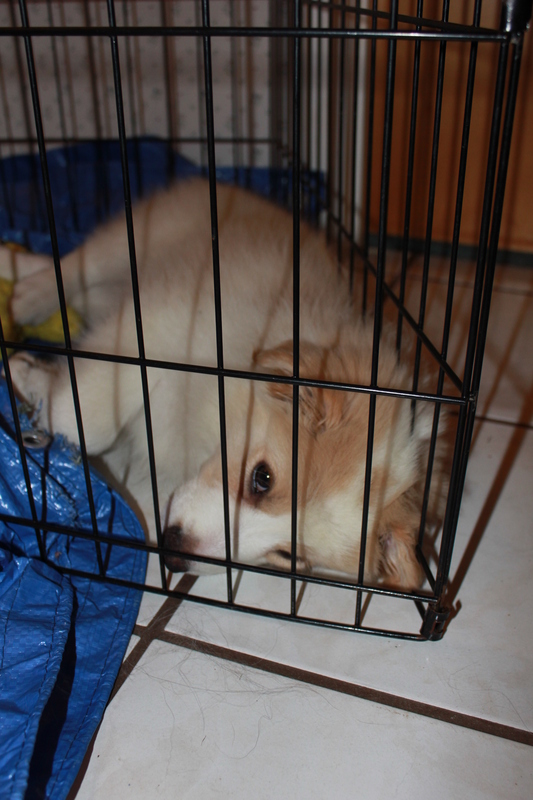 Will the puppy get his tooth or foot caught in the crate door, mess in his crate, become so stressed he becomes dehydrated? Of course so far, keeping in mind this is my Last and Final puppy, nothing bad has happened. But I can’t help worrying. If the training to have a relaxed house dog and thus never have a dog with separation anxiety is done at an early age, it gives the puppy a lifetime of confidence. In time he earns his stripes and can have the privilege of being loose in the house full-time. In return I have a calm dog that won’t destroy the house in my absence, a win-win situation for us both. Now I can relax knowing he passed the first day with flying colors. 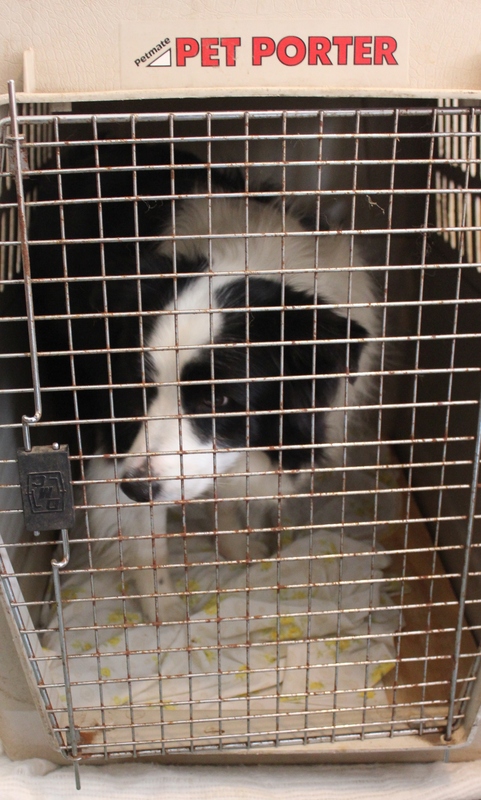 This entry was posted in Dog training, Dogs, Puppies and tagged Border Collie, Border Collies, Dog training, Puppies. Bookmark the permalink.